Making pizza is far easier than many people think. Here is a simple recipe to make the dough and cook it with toppings of your choice. When the yeast, water and sugar mixture is ready, pour this into the well in the middle of the flour. Add the water and salt plus the olive oil and approximately 200ml of warm water. Don’t add all the water at once, as the exact quantities will vary depending on how much water the flour absorbs. Mix by hand until it begins to form a dough, then pour onto a kitchen work surface. Knead vigorously until you have a smooth, pliable and elastic dough. Roll this into a ball. Sprinkle some flour into the now empty bowl that you used to start making the dough and place the dough ball back into the bowl. Take a clean tea-towel and run it under hot water, then wring it out to ensure it doesn’t drip. Place it over the bowl containing the dough. Leave the dough to rise in a warm and dry place for 1.5 – 2 hours. Once the dough is ready, it will have roughly doubled in size. Pre-heat the oven to the highest setting (or use a lidded BBQ on a high setting) and pre-heat a pizza stone in the oven / BBQ. Tear a piece of dough (the size of a large fist) and shape it into a thick round-ish shape by hand, then place it onto a lightly floured surface and, using a rolling pin, roll it until it is very thin (almost transparent if you want a really thin pizza), rotating it around so that you can use the rolling pin to create an even thickness. Spread on a thin layer of tomato passata or ‘sugo al pomodoro‘, sprinkle with oregano (optional) and a light drizzle of extra virgin olive oil. Add any other ingredients you wish to add, e.g. thin strips of ham. If you’re adding black olives, add these on top of the cheese, at the end. Place the pizza stone with the topped pizza back into the oven or BBQ, close the door/lid and cook for approximately 5 minutes (possibly a bit longer in the oven) until the pizza crust is crisp with a few brown parts nad the cheese is bubbling with a slight golden crust beginning to form in parts. Remove from the oven / BBQ and serve immediately. Repeat the process with the other pizzas. This is great fun for parties and children love to join in and add the toppings – but be careful of the hot pizza stone! Note: You can also use the dough to make Focaccia. 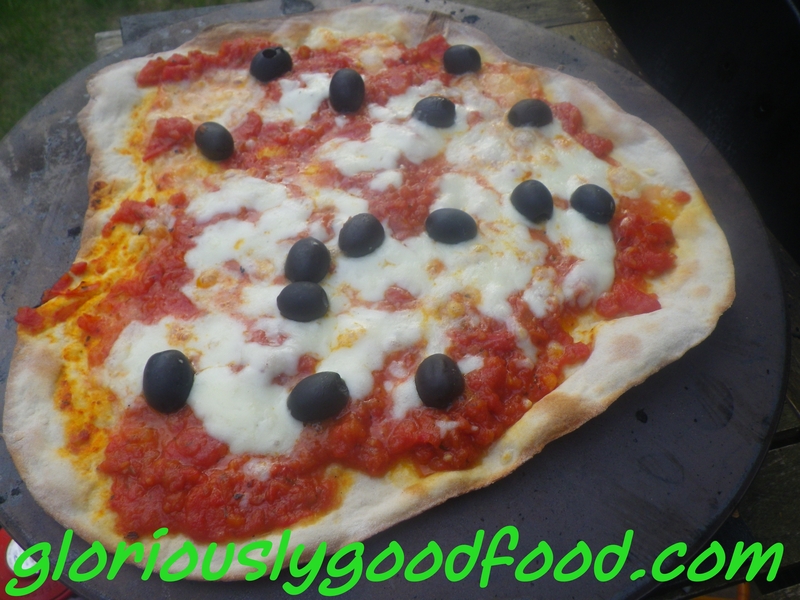 Pizza | Gloriously simple, gloriously good! This entry was posted in Italian, tomato, Vegetarian and tagged pizza, pizza dough, pizza stone. Bookmark the permalink.